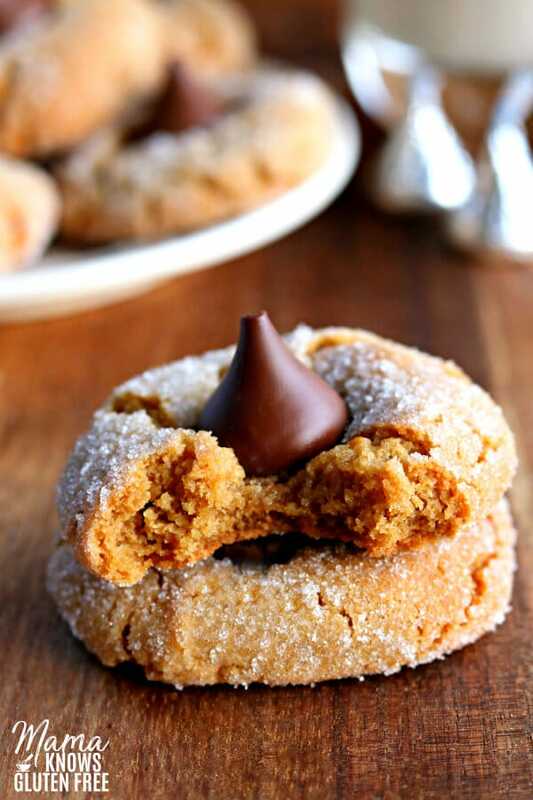 These gluten-free peanut butter kiss cookies are a soft gluten-free peanut butter cookie topped with a Hershey Kiss. Nothing gets better than chocolate and peanut butter together! The recipe also has a dairy-free option. These are the perfect gluten-free peanut butter cookies! They are soft and chewy and a little crisp around the edges. 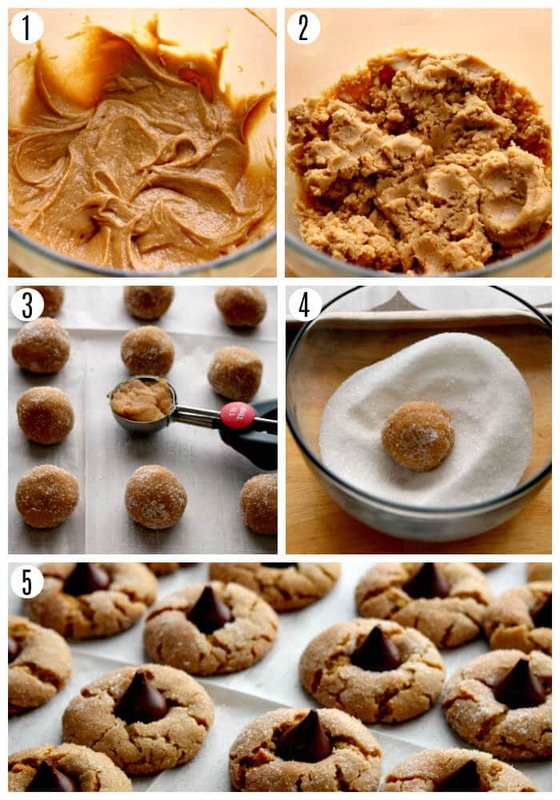 The sugar crust totally takes these peanut butter cookies to the next level! But what really does it for me, is the addition of the Hershey Kiss. I adore anything chocolate and peanut butter! It’s one of my all-time favorite flavor combinations. Really, who cannot resist a peanut butter cup?! Mix in the egg and the molasses. Mix until fully combined. Cover cookie dough and refrigerate for at least 30 minutes. Preheat oven to 375°. Add the 1/4 cup of granulated sugar to a small bowl for rolling the dough in. Mix the peanut butter, cocoa powder, and pure vanilla extract until fully combined. Add the powdered sugar and mix until combined. Your filling will start to firm up. Add the dairy-free mil and mix until nice and smooth. You can spoon the filling into the centers or pipe the filling the center (like I did). Not all flavors of Hershey Kisses are gluten-free please check your labels. 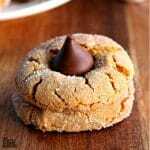 I have also included a dairy-free option to the gluten-free peanut butter blossoms. My husband, myself and youngest son are all dairy-free as well. I used Smart Balance butter for the dairy-free option. Hershey Kisses are gluten-free (not all flavors so make sure you check the labels) but they are not dairy-free. So I created a dairy-free chocolate peanut butter filling to replace the Hershey’s Kiss. So, now you too can enjoy a gluten-free and dairy-free sugar cookie. I promise that it is just as delicious dairy-free butter and the dairy-free chocolate peanut butter filling. 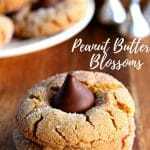 Peanut Butter Blossoms are one the most popular classic cookies that are made all year long. They are also one of the cookies I made during Christmas. I always see these popular cookies on a Christmas cookie tray. You could even make these gluten-free peanut butter blossoms more festive by rolling them in colored sugar crystals (like red or green). These gluten-free peanut butter cookies are a classic! They are super easy to make and always a crowd pleaser. Seriously, who does not love the flavor chocolate and peanut butter?! 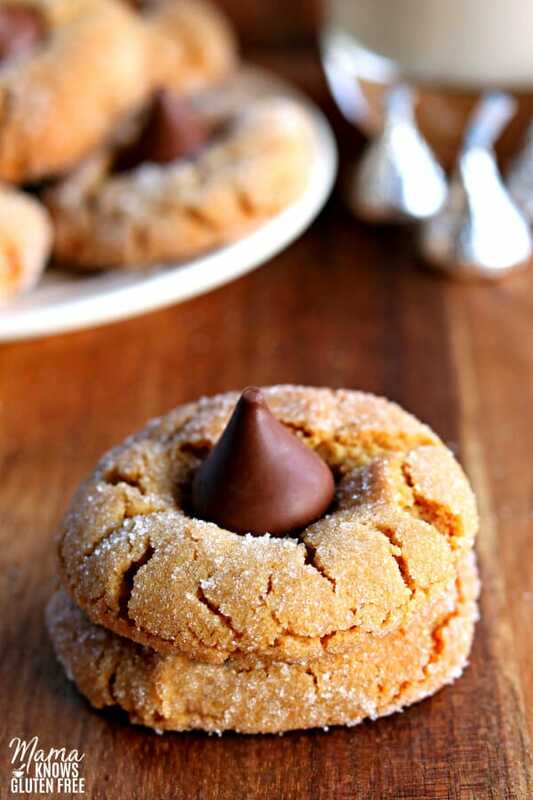 As soon as you bring the cookies out of the oven place the Hersey Kisses in the center of each cookie. 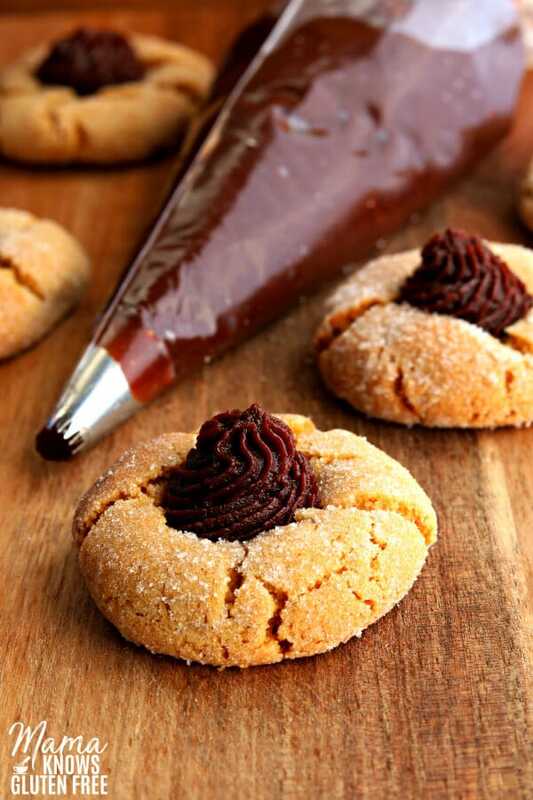 If you are using the dairy-free filling use the back of a teaspoon to make an indent in the center of the cookie. For dairy-free I used Smart Balance butter and made the dairy-free chocolate peanut butter filling. 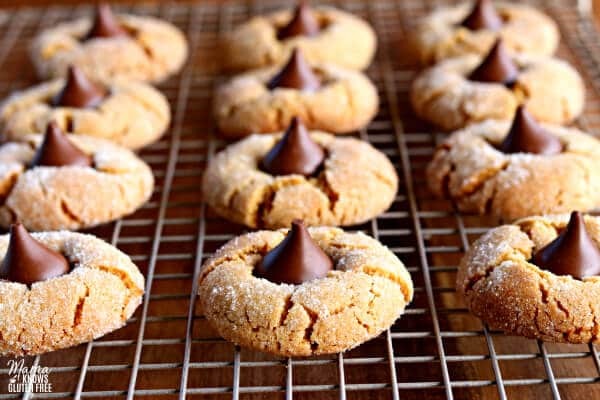 Love this recipe & the hint of molasses! They turned out beautifully! They have a slight outside crunch & softer inside. Not dry or brittle either. It is hard to tell they are GF. I rolled in green & red sugar for Christmas, used Bobs Red Mill 1 to 1 baking flour & real butter. Total winner! Thank you for posting it! Since these turned out so great, I also made your cinnamon roll cake today (which was AMAZING!!) and the gingerbread cookies. All were spot on deliciousness!! 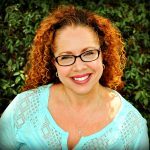 My holiday baking just got a little easier with many thanks to you! Hi Michelle. Thank you so much for the amazing 5-star recipe review! I can’t tell you how happy it makes me hear that you not only enjoyed the peanut butter blossoms but the cinnamon roll cake and the gingerbread cookies! Baking is one of my love languages and it makes my heart so happy to hear that others enjoy what I make for my family. You are so welcome and thank you for taking the time to leave a comment and review. It totally blessed me and made my night! Happy holiday baking and I hope you have a blessed Christmas.